Ottawa Humane Society: Meet Milo, our Wiggle Waggle Walkathon "Spokesdog"! Meet Milo, our Wiggle Waggle Walkathon "Spokesdog"! Hello everyone, I’m Milo! 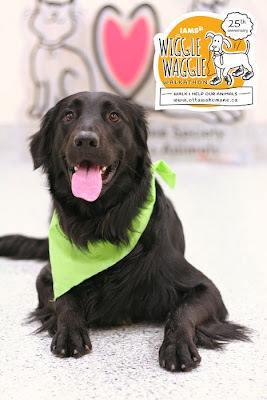 I’m a 1 year and 3 month old border collie / Labrador retriever mix. My tail is wagging happily because I’m the “Spokesdog” for the 25th annual IAMS Wiggle Waggle Walkathon! I’m so excited to represent this fun event that helps the OHS care for the animals. I was just a silly pup playing in the street in March when I got hit by a car. It hurt! A nice man called the Ottawa Humane Society. They picked me up in an ambulance and took me to see a veterinarian. I had lots of "road rash" and sadly, a badly broken leg. My previous family couldn't afford any medical bills. They signed me over to the OHS. There the friendly staff spoiled me with toys and treats, fixed my wounds, and they did an operation to remove my shattered hind left leg.I'm all better now, and have a new family. I am so thankful for my second chance. While I may only have three legs, nothing’s going to stop me from going to the Walkathon this year! You and your pooch can join me on Sunday, September 8th by registering online at www.ottawahumane.ca/walk. Help me raise funds so the OHS can be there for animals who need help – just like I did in March! A very special new event for the animals!